This unique loft-style studio space, overlooking Melrose Avenue in West Hollywood is perfect for Photoshoots, Video Production and Private Functions. This space is open plan with rustic interiors. With movable walls, wooden floors and modern spotlights, the space is flexible and the set-up can be adapted to suit your events needs. A wall of windows fills the space with natural light and a range of furniture give the space a welcoming and comfortable loft-like atmosphere. There are private areas that can be used for set-up or storage and easy access parking. 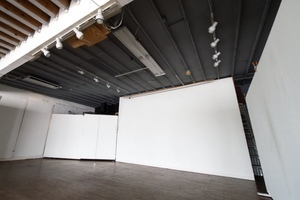 In the prime area of Melrose, this space is a perfect creative space for arts events. For more than a decade Melrose has been providing an affordable alternative to a wide variety of clientele. Event rentals start at $1500 and require a $350 security deposit and a $150 cleaning fee.